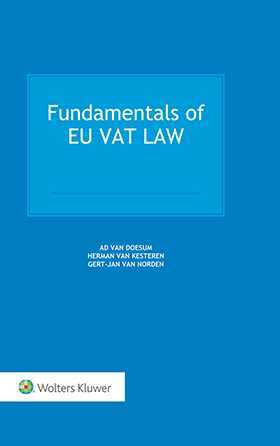 Fundamentals of EU VAT Law aims at providing a deep insight into the systematics, the functioning and the principles of the European Value Added Tax (VAT) system. VAT is responsible for generating approximately EUR 903 billion per year in tax revenues across the European Union – revenues that play a huge role in budgetary policymaking in the Member States. This extremely useful book provides not only a thorough description of the current state of EU VAT law, but also a detailed explanation of the system’s rationale and its legislative provisions. It puts the elements of the system in perspective and shows how they are linked to each other. The focus lies on the rules which can be deduced from the sources of EU VAT law and on their application in practice. how far a national court must and can go in interpreting national provisions in the light of the VAT Directive and the principles underlying the VAT system. The book follows the structure of the VAT Directive/VAT determination scheme, with additional topical chapters on immovable property, intra-Community transactions, and importation and exportation of goods. Furthermore, a comprehensive analysis of VAT rules based on real-life examples deduced from EU case law is presented, thereby illustrating the functioning of the EU VAT system. This book clearly shows how the elements of the EU VAT system are linked to each other and elaborates on the EU VAT determination scheme and how to proceed through it efficiently in any context. With its detailed attention to the meaning and interpretation of each legislative provision and court ruling, this book serves as an incomparable guide for practitioners. In addition, this book’s emphasis on the rationale and systematics of the EU VAT system makes it an indispensable reference for all tax law professionals and researchers in aiding them to take confident action guided by the current state of EU VAT law.